Although you will see three clean and clear photographs of the pampas cat below, visitors should know that the coat colour, pattern and texture can vary substantially across the range of this cat species which extends almost the entire length of South America. The coat of the cat illustrated below is long and it looks coarse. There are few markings on the body but the legs have heavy dark brown banding tapering to dark lower limbs and paws. 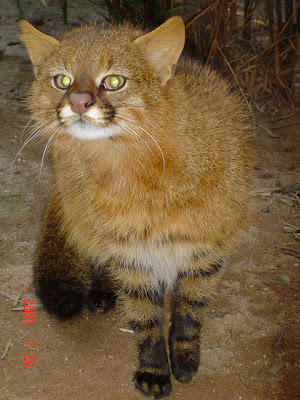 However, in some areas the pampas cat coat is “short, soft, and vividly spotted in red-gray and striped”. The background colour of the coat varies from yellowish white to greyish brown and then to silvery gray with a range of colours in between. Apparently there are three main variants of its pelage, but all have “two dark lines on each cheeks”1. That description is possibly a little misleading as the photograph of the cat below attests. But it has been argued (by Garcia Perea in 1994) that the pampas cat is in fact three closely related species. 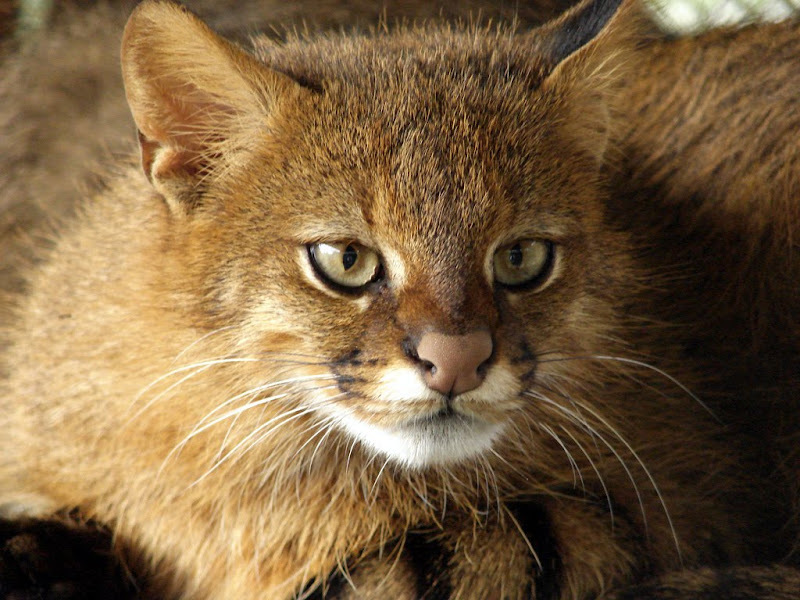 The pampas cat is about the size of a domestic cat. The tail is short; half the length of the head and body combined at 23 to 29 centimetres (9.1 to 11 in) long. The tail is bushy and sometimes indistinctly ringed with brown or black. The chin is white. From Pampas cat description to wild cat species by size. The photograph by Fred Hood (left) is of a melanistic, black pampas cat. Read about melanism on this page. This entry was posted in Pampas cat, Wild Cat Species and tagged Pampas Cat, Pampas Cat Description, small wild cat species, wild cat species, wildcat by Michael Broad. Bookmark the permalink.